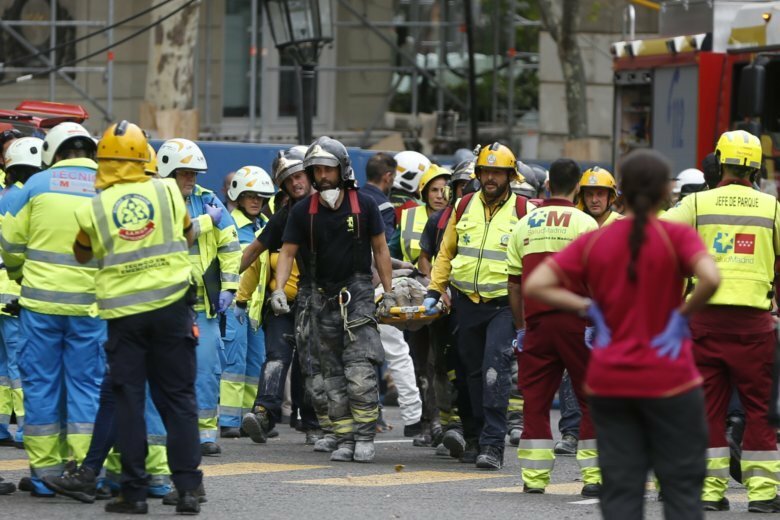 MADRID (AP) — Scaffolding at a luxury hotel undergoing renovation in central Madrid collapsed on Tuesday, killing one construction worker and injuring at least 11 others, an official said. Wrought iron work on the sixth floor of the centrally located Ritz Hotel collapsed shortly after 4 p.m. (1400 GMT; 10 a.m. EDT), dragging the internal scaffolding down five stories along with the workers, according to the official from the emergency services. Most of the workers emerged on their own and were treated for injuries ranging from minor to moderate, with two of them hospitalized in critical condition. Firefighters rescued three people from the rubble with moderate injuries and were working to recover the body of the worker that was killed. The official, who spoke on condition of anonymity because she wasn’t authorized to be named due to internal rules, said the local Madrid police would be investigating the cause of the collapse, which emergency services called “an occupational accident” in a tweet. An Associated Press photographer saw ambulances and firefighters working at the scene surrounded by dozens of onlookers. There were no signs of the collapse visible from the exterior of the building. The Ritz Hotel, located near Spain’s parliament and Madrid’s famed Prado and Thyssen-Bornemisza museums, had been closed for a full renovation since March. AP photographer Paul White contributed to this report.